As winter settles in, some families in Japan are preparing for the festive season. For many in Japan, Christmas is about romantic dinners, frosted pastries and fried chicken. But there are many families who also enjoy Western traditions such as decorating the tree, carols and gift giving. Even though it’s not a holiday in Japan, for those here, Tokyo offers lots of ways to get in the Christmas spirit. The Christmas Market at Yebisu Garden Place (on until Dec. 25) has been running for almost 20 years. Expect a 10-meter tall Christmas tree and a dazzling 5-meter tall Baccarat chandelier. For a larger and more traditional-looking market, head to Hibiya Park. From Dec. 14 to 25, you’ll find all the snacks and holiday trappings, as well as carolers. It gets quite crowded, but has more space along its periphery for kids who need to run around. No family Christmas in Japan would be complete without seeing a few illuminations, and the markets mentioned all have displays nearby. Roppongi’s Keyakisaka-dori is one of the most dazzling street displays, while the golden lights of Yurakucho, Marunouchi, and other areas neighboring Hibiya Park are also worth a visit. That said, there are plenty of other places with illumination displays. Tokyo Dome City may not always be as dazzling as some mentioned, but it has a carousel nearby, which makes it a family favorite. Venues like Shiodome and Tokyo Midtown both offer a more modern take on illumination traditions. This year’s display at the Caretta Shiodome shopping area takes its inspiration from Pixar movies. Every 15 minutes, alternating shows will use music and artistic elements from the films “Frozen” and “Tangled.” Visit early, and you’ll see the 5 p.m. show based on the “Incredibles” franchise. Tokyo Midtown is offering something more atmospheric. Its displays incorporate bubbles, mist and glowing balloons to achieve its outer-space theme. Another fun winter activity is ice skating. Meiji Jingu Gaien Ice Rink and the Citizen Plaza’s ice rink in Takadanobaba are open year round, but the festive season also offers some temporary outdoor rinks. You’ll find a nice one in Tokyo SkyTree’s Solamachi area. The Sacas shopping center in Akasaka is also popular. Both offer skating lessons for kids, too, but sign up early. Yokohama’s Red Brick Warehouse also has a temporary ice rink worth the trip south, but for the best ice skating day trip, head west. 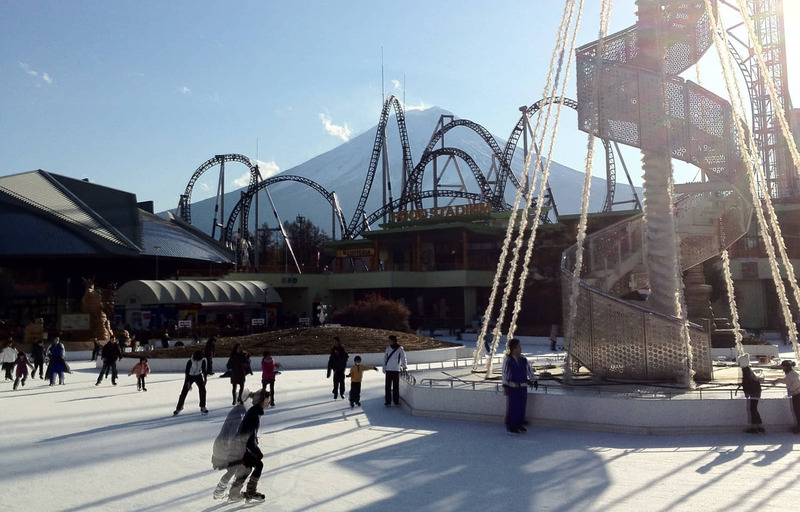 Our favorite skating location is a few hours away from Tokyo at Fuji-Q Highland amusement park. 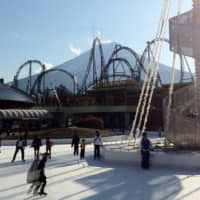 Here you can glide across the ice with Mount Fuji in the background. Kids new to ice skating can use double-bladed skates for extra stability and if you get bored, there’s always the park’s roller coasters. Unlike the Disney parks, winter at Fuji Q is often less crowded. For some, the full Christmas experience means meeting Saint Nick himself. Yes, Santa Claus does make visits to the archipelago, though he’s not found in as many places as you may expect. Visiting times will emerge on the websites of toy stores, department stores and fancy hotels soon. In past years, some of the best places to find Santa have included LaQua and Takashimaya shopping malls, and Toys R’ Us outlets. Santa sightings have also been reported at Roppongi Hills, Tokyo Midtown and Kidzania in Toyosu’s LaLaPort shopping center. Naughty or nice, you and your kids should find plenty to be jolly about.